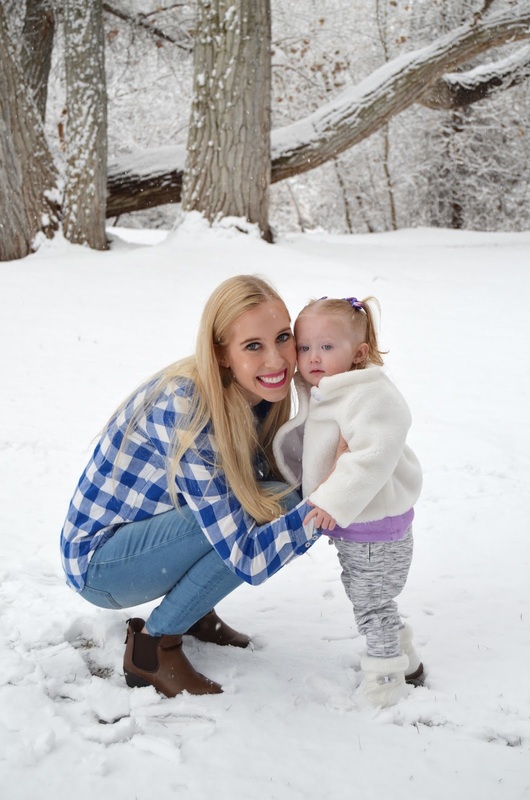 It seriously was a winter wonderland when we were taking these pictures! It has been snowing in Provo nonstop and I keep wondering when it will end. It is so pretty when it is falling, but I'm not going to lie, I am starting to get spring fever. I feel like I have so many things to look forward to like Chanse getting the summer off of school, the arrival of our baby boy, and taking Rosalie to do all sorts of fun things outside. I have to give a shout out for these jeans. They have a stretchy top and are once again great for maternity. What gorgeous pics! Sights like these make me miss snowy weather that we definitely don't get in southern California! Thanks for sharing! Cute outfit! Love the color blue of your shirt! You look so pretty! I love all the snow! Thanks for sharing, have a great weekend! Loves! What a beautiful winter wonderland! <3 <3 Ps. why are you so cute? Your daughter is darling too. You two are the absolute cutest! Lovely pictures! Your top is super cute. That top is simply adorable. Love how you styled it simply! Y'all are adorable! Love a great and easy casual look. Thanks for linking up with us this week.